I was at work ytd when this happened. A Chinese auntie & daughter came to my events booth, wanting to try a pair of shoes. There were many customers at that time and I was busy w another lady when.. Suddenly I heard a high pitched..
Chinese auntie: Amoi! Size tiga enam! Me: ... *repeats in Cantonese* Wait for awhile. 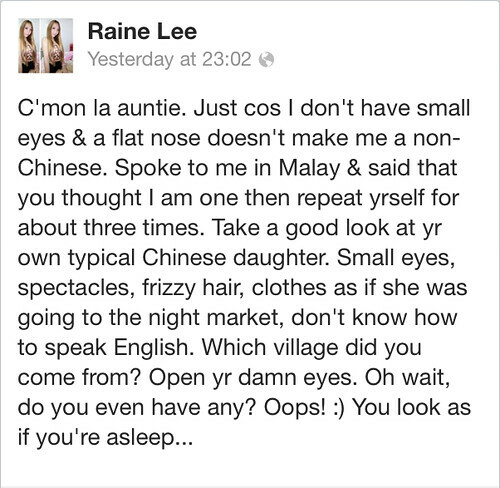 Chinese auntie: OHH 我以为她是马来人 eh! While checking if the size is available or not.. I came back downstairs and..
Why must she repeat herself so many times ah? Other customers were looking at me, at US, so I wanted to quickly get this done & over with. I wanted her outta my sight. What is this about? Public humiliation? But of course I didn't say anything back, I am working after all. I stayed calm & figured that I can rant all I want later when they're gone. Not really, apparently. Bcos, okay here comes the “main character”. The person behind why I'm blogging this now. It's not entirely about that Chinese auntie but rather some self-righteous woman whom I don't even know or will ever bother to know. 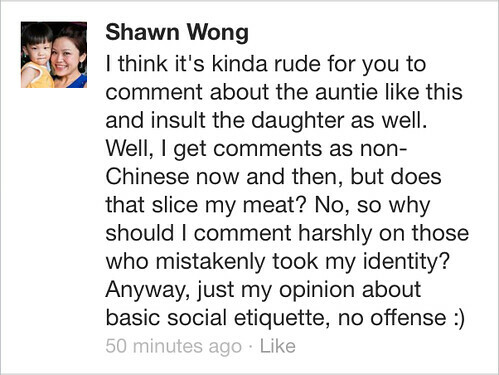 Her name is Shawn Wong. Yep, IT'S a she, w the name Shawn. Geddit? You don't? Lol me neither. What happened was I posted a FB status. Yeah, I know I wasn't nice. But it was purely out of irritant. 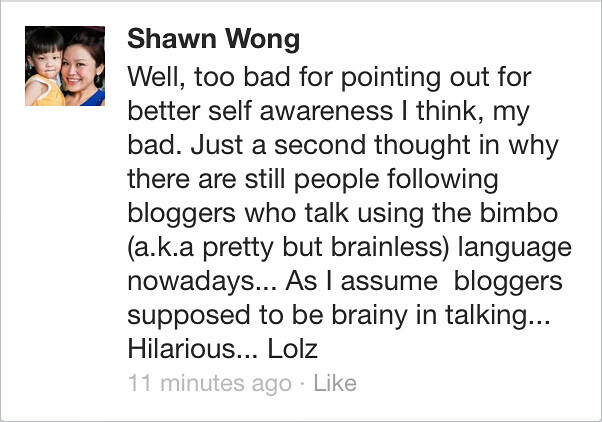 Shawn's itchy hands decided to comment out of the blue. 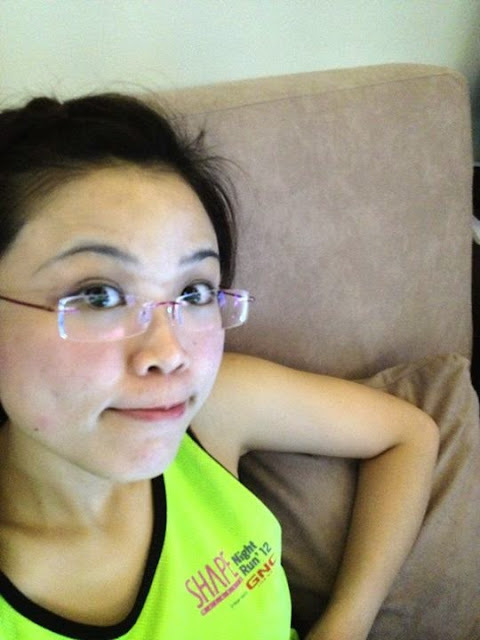 I don't even know she exists :O This woman is not on my FB friends list so may I know what were you doing there, Mrs Cray Cray? & well, offense taken of course. I don't want to know about yr life story, why compare you & I? Every individual is different & handle certain things differently. You're old enough to know that. And even if I was wrong, mind your own business. When she has ntg else to say, she attempts to provoke me about the way I type haha. Why are you trying so hard to get at me? What have I ever done to you? :( Thanks for calling me pretty though ;) & besides, the things you said about me actually reflects back on yrself :/ Me? Rude? So are you. & then, Mrs Cray Cray decided to block me. Shame. You came along & opened yr big mouth, said whatever you felt like, then hide? Suits you. Just a little advice though; you're a mother already, act like one. Lol. When people are self-righteous, they aren't getting their sense of righteousness from themselves. They're getting it from other people. Which makes them soo annoying. Why not leave me be & keep things to yrself? Why choose to start an argument w a young girl whose life has ntg to do w you? My status wasn't aimed at you & you obviously know it. 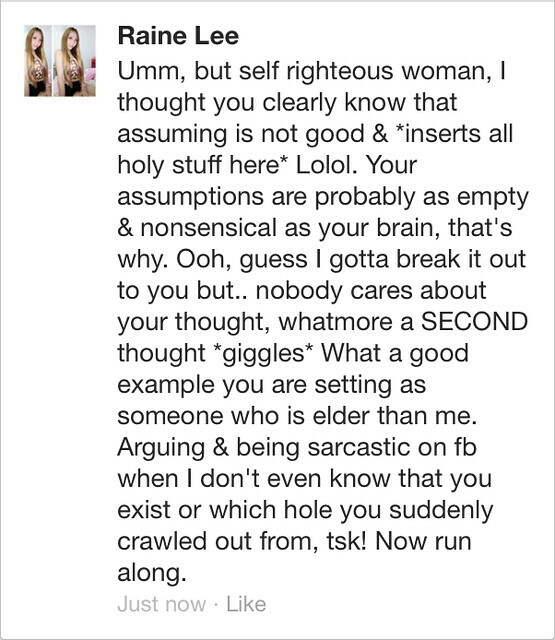 You're not a judge whatsoever, why go around other people's FB posting your “teachings”? 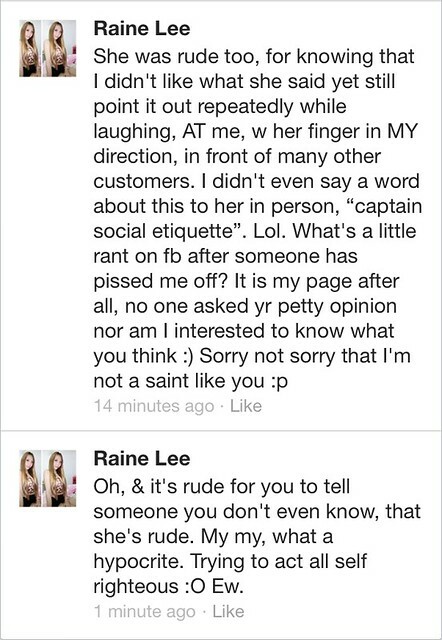 Nobody cares lah (^__^)v Oh, & thanks for being a small entertainment. Good clown, clever clown, it was fun while it lasted lol. Good riddance! Nah. She's too power dy! Hello b. Replying after 3 years lolll.